My revisionist trawl through the dress of the King’s German Legion (ten pages so far, artillery and engineers still to come – menu to your right) has thrown up some small surprises along the way; the more you think you know, the less you really do. 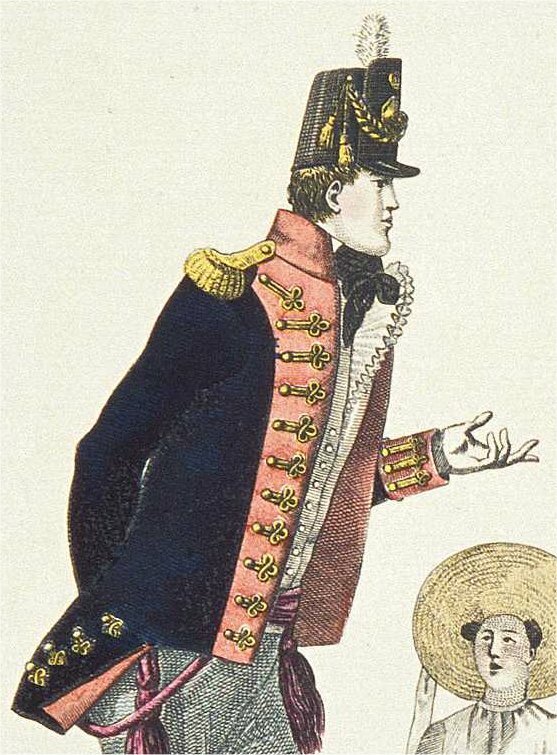 What jackets, for example, did artillery officers adopt with the great uniform shift of 1811-12? All the secondary sources seem to show something with an extended lapel and bags of heavy gold embroidery, often including a loop diagonally at the top, as here in what I think must be a photo from an old JSAHR. The relative economy of the braid means that this has to be an undress jacket, and it was indeed worn, as shown by this detail from an Occupation print (Le Bon Genre 83) – ten loops down the lapel, but otherwise a perfect match. Two other period images of what may be a variant version of this jacket are attributable to the KGL, and will be discussed on their forthcoming Artillery page. If this was the undress, what of the dress version? Of the three tailor’s sources, Hawkes alone appends this note: “The Dress Jacket richly Emb[roidere]d with Gold.” And indeed, I find in the Meyer ledger [see KGL pages and posts passim] that a lieutenant of a foot battery of the King’s German Legion ordered in 1814 “An embd Regtl jacket”. “Embroidered” here has to mean hand embroidered gold loops, doesn’t it? An expensive option, which set our lieutenant back almost £20 – a cool £1280 in today’s money, according to one online historical inflation calculator. On a related tack, what’s this [above] that Charles Hamilton Smith shows in his 1812-ish chart for the Horse Artillery? Red lapels with braid loops – “unaccountably” according to the commentary by Philip Haythornthwaite, who rightly denies that such a thing was ever worn. 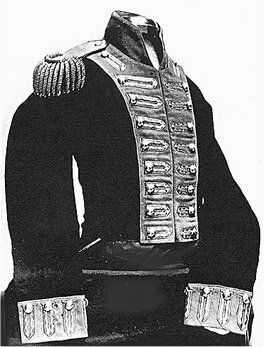 Though the crow’s feet, or eyes or whatever, seem to be at the wrong edge of the lapel, this image has to be related to our foot artillery officers’ jackets above, even though it shows what Smith thought the other ranks were supposed to wear. 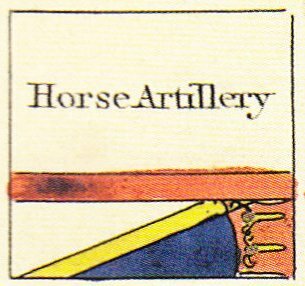 Could it be that a proposed Horse Artillery pattern crept in, only to be dropped by the Clothing Board after Smith’s chart had gone to press? 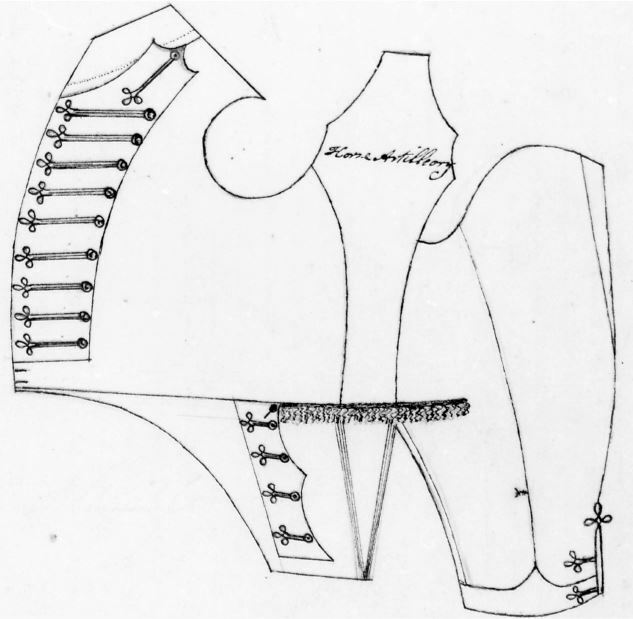 So it seems, for William Stothard’s notebook also contains, without commentary, this fascinating drawing [below] of a new pattern jacket for officers of the “Horse Artilleory”[sic], in full 1811 light dragoon style, complete with rear pleats and fringe, and a strap lapel with braid loops as per the foot artillery. It becomes obvious that the light dragoon lapel (one button in the top strap, then a gap, then the rest) is the missing style link that explains the form of our foot artillery jacket lapels, both braided and laced. So what became of the “”Horse Artilleory” jacket? In the event and by whatever rationale, this slightly left-field idea of the Prince Regent’s was quietly kicked into the long grass, and the RHA kept a proud grip on their existing multi-looped dolmans, as retained even today by the King’s Troop. 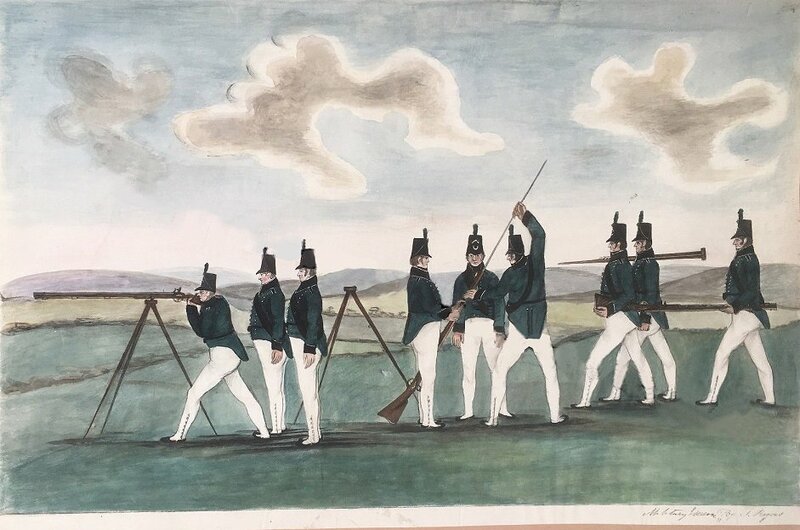 As a postscript, here’s a related puzzle – a detail from a watercolour by Denis Dighton in the Royal Collection, dated 1813, showing gunners of the Royal Artillery in lapelled jackets modelled on those of their officers, complete with a diagonal loop of lace at the top. (The lace in this image has a goldish cast but can only be intended for yellow, surely? The shape of the loops – square ended, pointed or perhaps even bastion – is not really clear. The inverted lace triangle on the rear skirts is an odd touch, too.) Such jackets were never worn, so why does Dighton show them? As a record of a proposed pattern for the other ranks that never saw the light of day? Since prestige confers publicity, the iconography of the great volunteer movement of 1794-1808 is very London-centric. This is true not only of the uniform prints and portraits of obscure colonels, but also of commemorative prints of reviews, among which Hyde Park predominates. “GRAND REVIEW Of the GENTLEMEN VOLUNTEERS of Leeds, Wakefield, Halifax, Bradford, and Huddersfield, as commanded by Lieutenant-Colonel Lloyd, and reviewed by Lieutenant-General Scott. MR. HOPKINS, Miniature-Painter, No. 27, King-street, Bloomsbury-square, London, begs to acquaint the Ladies and Gentlemen of the above-mentioned Places, and their Environs, that the PRINT of the GRAND REVIEW, from his PICTURE taken on the Spot, is now finished, and to be seen at Mr. Wright’s, Printer, and at Mr. Greenwood’s, Bookseller, Leeds; Mr. Meggitt’s and Mr. John Hurst’s, Booksellers, Wakefield; Mr. Brook’s. Huddersfield; and at Mr. Edward’s, Halifax; where Subscriptions are received. The enterprising Mr Hopkins’ original painting may be lost, but a few prints survive. In 1976 I looked at the copy held by the Thoresby Society in Leeds, thickly varnished and a bit the worse for wear. Forty years on, this has been donated to Leeds Museum; despite conservation efforts, it has suffered further in the interval, but at least a nice big image is available online here. Hopkins’ detached perspective means that the assembled ranks appear far smaller than the less interesting foreground figures, but there’s still plenty here to round out our otherwise patchy view of this 1794 generation of volunteers. From the left of the picture stand the Leeds, Bradford, Huddersfield, Royal Wakefield and Halifax Volunteers in that order, all in scarlet faced respectively with blue, buff, blue, blue and black. The Bradford and Halifax “battalion guns” (two brass six pounders in each case) hold the ends of the line, while the West Riding Yeomanry keep the field and chase away stray dogs and naughty boys. The artillery detachments are in blue with round hats, while all the drummers except the Wakefield are in white. All in are short gaiters. The grenadier company of the Halifax are in fur caps, while all the light companies (at the viewer’s right of the rear echelons), and all ranks of the Huddersfield Fusiliers wear Tarleton helmets. Not at the event (at too much of a distance, presumably) are the Loyal Independent Sheffield Volunteers, the Doncaster Volunteers, York Volunteers and Royal Knaresborough Foresters, all likewise raised in 1794. Mr Hopkins’ advertisement doesn’t give a price for a copy of this grand and interesting Spectacle. These can’t have been cheap, though; the hand colouring must have been one heck of a chore. 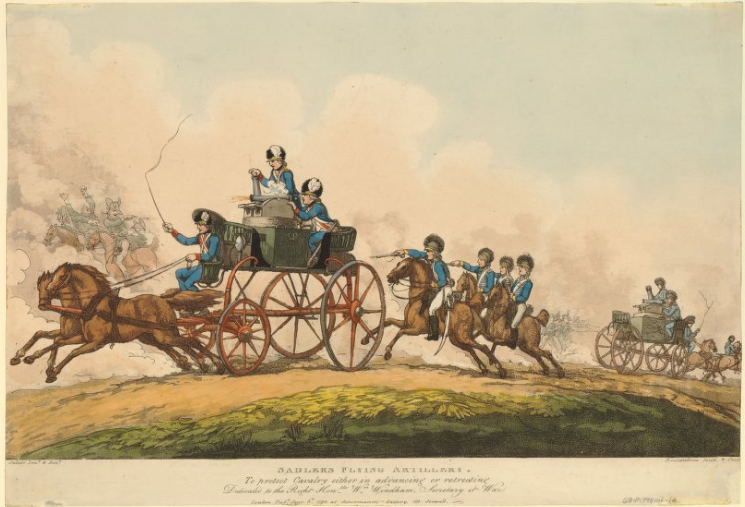 As it happens, this blog takes its title from the dedication page of Loyal Volunteers, Ackermann and Rowlandson’s gigantic 1799 compendium of London armed associations. 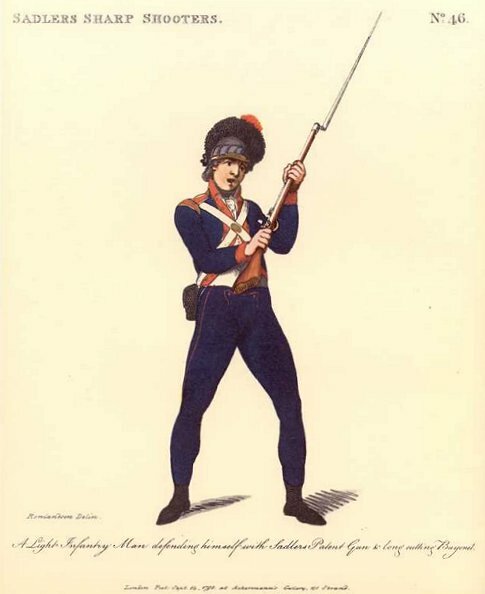 I’ve always thought one of the more interesting entries to be plate 46, which shows a member of Sadler’s Sharp Shooters – “a Light Infantry Man defending himself with [James] Sadler’s Patent Gun & long cutting Bayonet.” The figure is chic in a Tarleton and dark blue jacket and pantaloons with red trim. The “patent gun” appears rather short, but the bayonet is enormous. 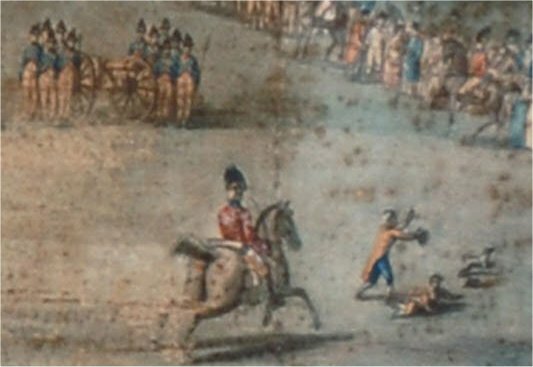 Some copies of Loyal Volunteers also contain an unnumbered and spectacular plate portraying “Sadler’s Flying Artillery” (high res image here) showing the nearest we get to Georgian tank warfare – two guns of Sadler’s own invention mounted on a light carriage drawn by two horses. In the text to the first plate this is described as “the celebrated War Chariot, in which two persons, advancing or retreating, can manage two pieces of Ordnance (three-pounders) with alacrity, and in safety, so as to do execution at the distance of two furlongs.” Options for “advancing or retreating” were enabled by setting the guns on a turret; to reverse their fire the gunners simply switched seats. As James Sadler had not got round to inventing armour plate, I’m uncertain about their “safety”, but you can’t have everything. 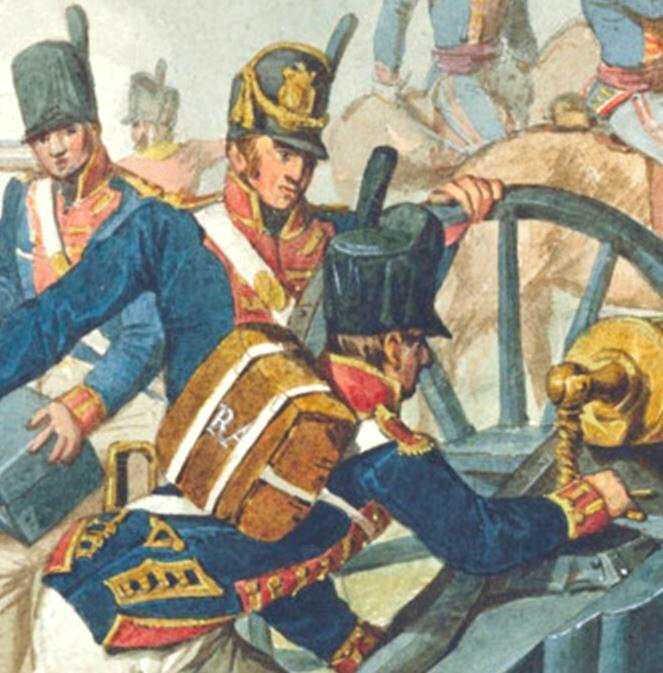 The patent gun and the flying artillery were real enough, their virtues detailed by their inventor in his own Account of Various Improvements in Artillery, Fire-Arms, &c of 1798. According to Mark Davies’s biography of Sadler, both “musquet” and “moving battery”, or “curricle flying artillery”, were unveiled on June 4 1798, the King’s birthday. With the backing of Secretary at War William Windham, the latter was demonstrated successfully before royalty in 1798 and 1800, and may possibly have been shipped abroad with the army on the expedition to Holland in 1799 at the behest of the Duke of York and under the care of Sadler’s son, James junior. 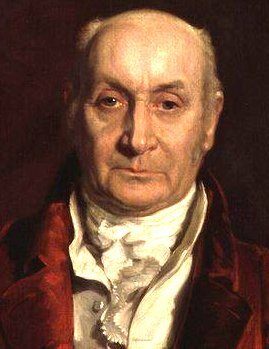 Equally real, perhaps even larger than life, was James Sadler himself – aeronaut, inventor, chemist, naval technologist, steam engineer, creator of “philosophical fireworks”, barracks master and confectioner. There is, not surprisingly, a good deal of information available online about this extraordinary man; much more could be said about him than I have space for here, and Google will soon find it for you. But if the guns and their inventor were real, how actual were the Sharp Shooters? I have to own up to some big doubts. Rowlandson’s fine plate is dated September 1798, but its accompanying text of August 1799 admits tartly that the corps was, even one year on, “but inconsiderable in number” and “in so imperfect a state as not to admit of illustration satisfactory to the Public.” However, it was “intended to extend them to a degree of respectability,” after which they would hopefully “join with the Westminster Associations”. A tad dysfunctional, then! The text lists no officers (included with every other plate), not even the “ingenious Machinist” himself, but blags quaintly that the corps “is shortly to be officered by the Honourable the Board of Ordnance.” I can find no officers for the Sharp Shooters in the Gazette, members of the Board of Ordnance or not, and according to Mark Davies both the patent rifles and the war chariot were used in 1798 by the Pimlico Volunteers, with whom Sadler had some sort of connection. 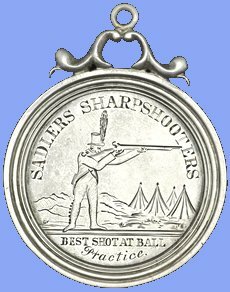 There exists, however, a medal for the Sharp Shooters, for “Best Shot at Ball Practice,” awarded to a Corporal William Staples, which was sold a few years back at a prestigious auction house. However, the figure on the medal is dressed in a round hat with a tall feather, while the award is dated September 30 1802 – a time at which the corps might be expected to have stood down, like every other volunteer unit, following the Treaty of Amiens earlier that year, rather than hold a shooting match. I’m no expert on volunteer medals, but I have read that some are known fakes, and it must be simple enough to engrave something feasible on a silver blank. In Irwin’s War Medals and Decorations of 1910 this actual medal is said to be then in the collection of a Colonel Gaskell, so if it’s a fake, it’s a vintage fake. 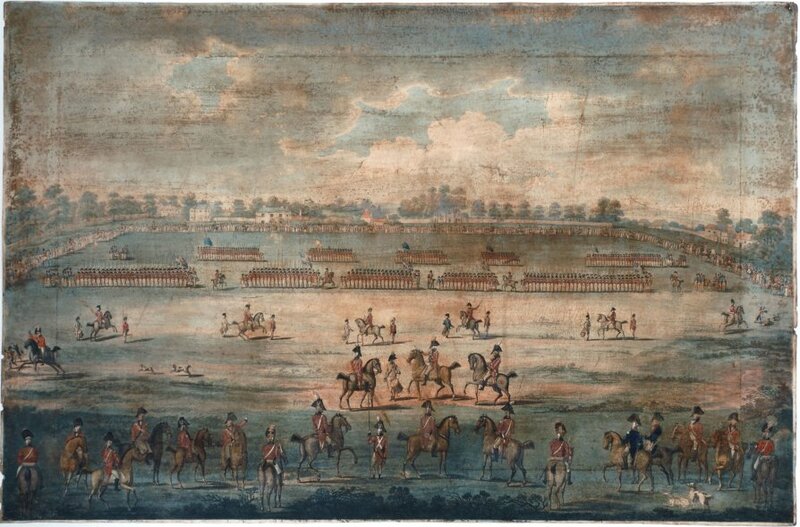 If genuine, it may be the single surviving piece of evidence to confirm the existence of Sadler’s corps as a functioning military outfit outside the pages of Rowlandson’s Loyal Volunteers. Or were the chimerical Sharp Shooters merely a good intention? Or an ingenious PR fiction created to publicise their director’s inventions?